Jack Stuhler, the founder of Eezi-Awn, is an adventurous man and has spent his entire life exploring the African Continent. 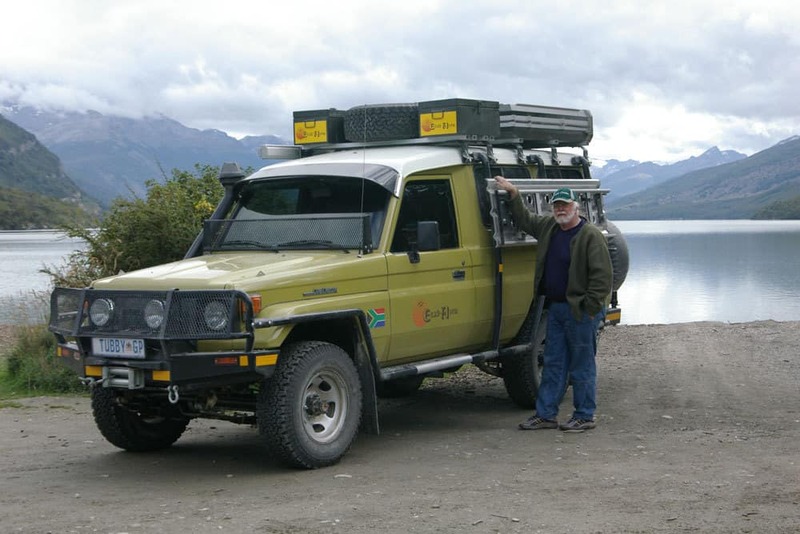 After driving from Johannesburg to the UK through the middle east in the early 1999, Jack set his sights on the Americas. 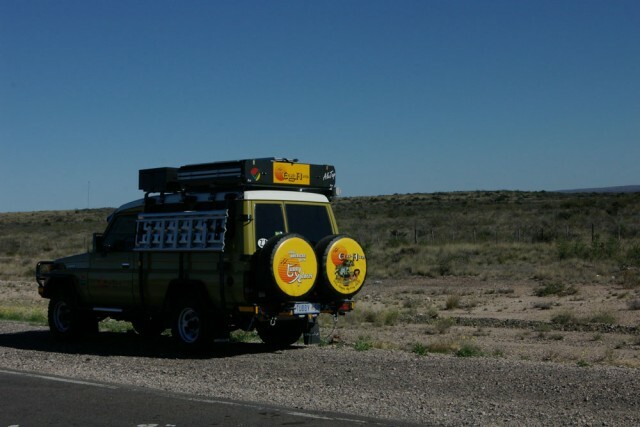 He prepared a Toyota Land Cruiser 70 Series Troopy by the name of Tubby for his journey and shipped it to South America. With his significant other, Margaret, their epic journey from Ushuaia to Dead Horse Alaska took over 18 months to complete in 2004/2005. They later returned south to Houston, and shipped Tubby home. Quite impressive for a couple in their 60s. Their adventures are an inspiration for us all. At last! After much planning and extensive research, we hit the turf of South America and flew into Buenos Aires on the 22nd February 2004. 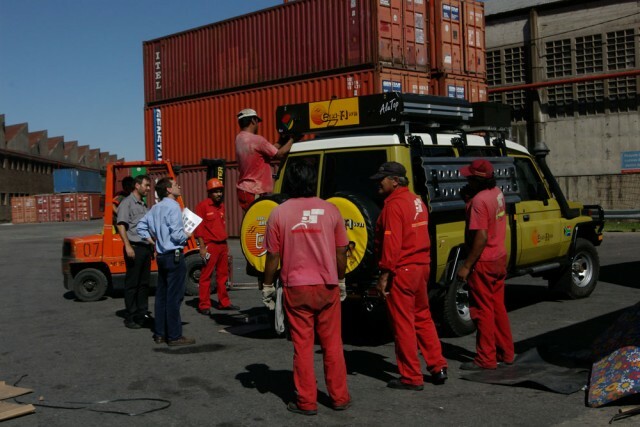 The ship carrying the FJ75 Land Cruiser, Tubby Xplorer, which was loaded almost a month previously in Johannesburg arrived Monday the day following our flight. It was another three days before we could unload the container, complete Customs, and fit the roof tent, retractable awning, third spare wheel plus storage trunks on top of the vehicle readied to be driven to the parking area across the way from the hotel where we had taken up temporary residence. It proved very practical – we could re-pack and organize equipment which was already on board as well as additional equipment we brought with us on the aircraft e.g spare cable for winch, sundry equipment, digital SLR camera, lenses, video camera, lap-top computer, a very compact mini printer, and a Motorola 9505 satellite phone. Very soon we left the perimeter of Buenos Aires and found ourselves zooming along south cruising at roughly 100 kmph – maximum speed here in Argentina is 110 kmph. I kept the vehicle humming along well within the permissible speed limit which also helped with consumption of an average slightly lower than 14 litres per 100 kms. Diesel was much cheaper here than in South Africa – a bargain all the way for us anyway at under R3 to the litre. We drifted ever further south and the first night on the road we stopped over at Bahia Blanca and took refuge in Hotel Austrel as camping was non existent. A blessing in disguise this gave us another chance to reorganize our housie on wheels that was to be our home for the next year at least. Every nook and cranny utilized for storage. A couple of days later having crossed Rio Colorado we drove into Baineario El Condor after visiting the oldest lighthouse in Patagonia and overlooking the high cliffs at sea’s edge where literally hundreds of burrowing lorokeets (a type of burrowing parrot) breeds. Our campsite here was reasonable comfortable and clean. Many travelers traversing Patagonia on foot, bus, or their own wheels would call it hell. This land has always been synonymous with vastness, loneliness, and to many overlanders, boredom. But who gave it its name? It is surmised that in 1520 when Magellan and his crew wintered at Bahia San Julian, saw Tehleche Indians, tall of stature and wearing moccasins that made their feet appear exceptionally large which it is believed led him to name these people after the Spanish name Pata, meaning paw or foot, and thereafter referred to them as Patagoni and their land Patagonia. Makes sense come to think of it. 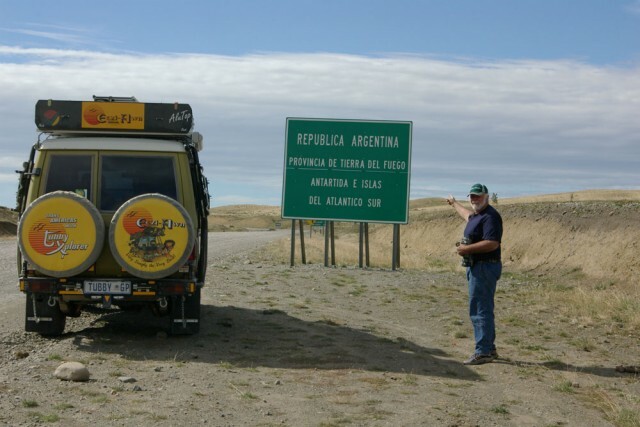 Stretching from Rio Colorado in the north and south to Rio Gallegos the last frontier town before entering Tierra del Fuego and from the Atlantic coast to the Andes in the east in excess of 26,000 square kms in area – vast yes, unimaginably vast. It is strange however when driving down Ruta 3, Margaret and I were awestruck with these open spaces but never bored. 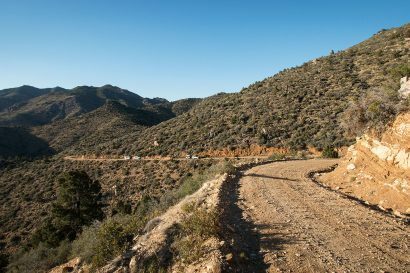 In Spanish they say ‘ochos-ocho’ if you keep your eyes peeled you see many wondrous things en route – change of vegetation, topography, marvelous sunrises, sunsets and landscapes. 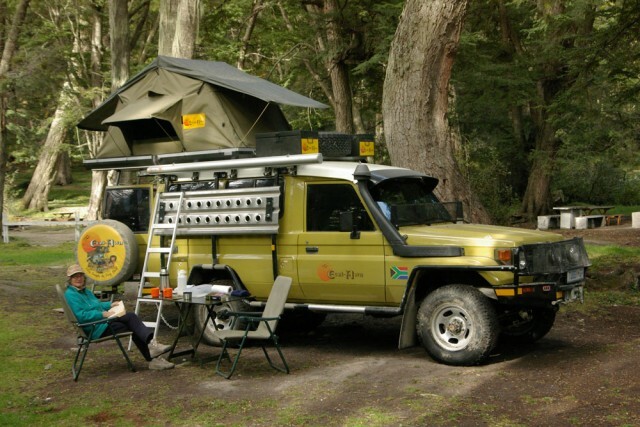 Moreover wildlife such as guanacos and caracara and and and – nature is surely a palette of marvelous images. When the wind blows across Patagonia it reminds us of the Easterlies that invade the Cape Peninsula at times. When driving with the wind from behind it feels like skimming along Ruta 3 as a Brigantine with sails filled to the brim sailing across the ocean – an absolute pleasure but oh boy should the wind turn and you have it straight from the front it is like seven sheets to the wind!!! At times you crawl along at 60 kmph in third gear then distance seems to be that much farther. But what the hell!! It is all part of our South American adventure. Our first rain – left early and drove to Los Grutos. An annoying occurrence when you drive from one province to another you are immediately confronted by the Policia and officials who confiscate fresh fruit, vegetables and raw meat which you may have bought only hours previously only to be destroyed in a mulching machine – what a waste. We learnt very quickly to barbecue the meat soonest and consume frutas before one crosses into a new province. Come to think of it when we cross into Botswana the local officials search for fresh produce and destroy once found. Venturing further south we drove into Peninsula Valdes. We thought that we had got towards the end of the tourist season but still hoards of them – busses and mini MPVS flying in every direction as if it’s an emergency. Ripio roads don’t seem to bother these Argentinians. 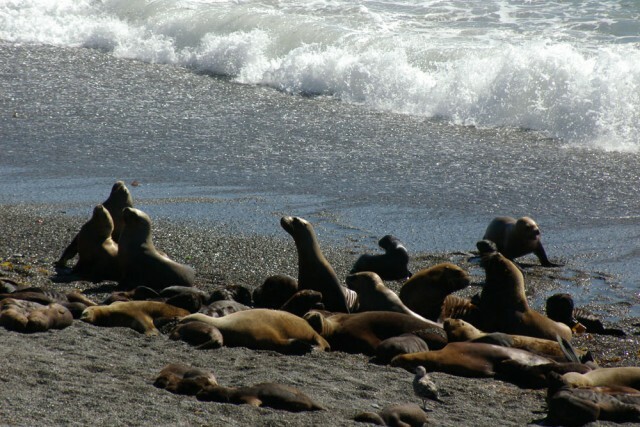 The Peninsula, one of South Americas finest reserves, is home to sea-lions, elephant seals, guanacos, rheas, Magallenic penguins and many sea birds. Often frequented by the Southern Right Whale which come into the bay in and around Valdes between June and December. Then of course the Orcas (Killer Whales) that come to feed off the young sea-lions and seals during the summer months and breeding season. Sheep estancias occupy most of the Peninsula that in 1999 was proclaimed a World Heritage Site by UNESCO. We camped at the Municipal site in the only village on the Peninsula, Puerto Piramedes. 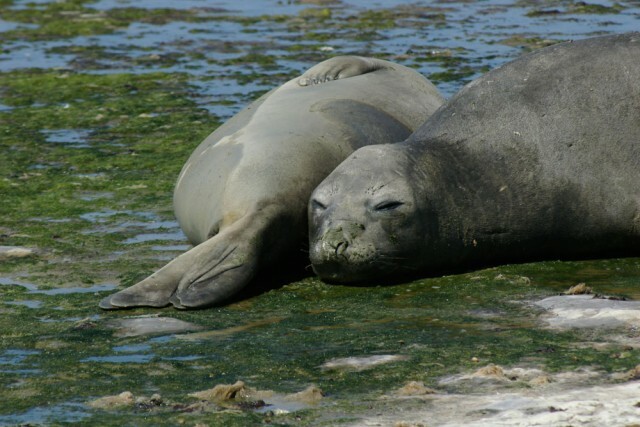 Most of the seals, whales, Orcas and penguins leave the shores of Argentina to forage out at sea for a couple of months and then return to breed. Sad, we were just too late. However, we did see quite a number of land mammals – Patagonian fox, tiny armadillos that play possum, lie flat on the ground or try to hide in the scrubland rather than roll up for protection when confronted or disturbed. 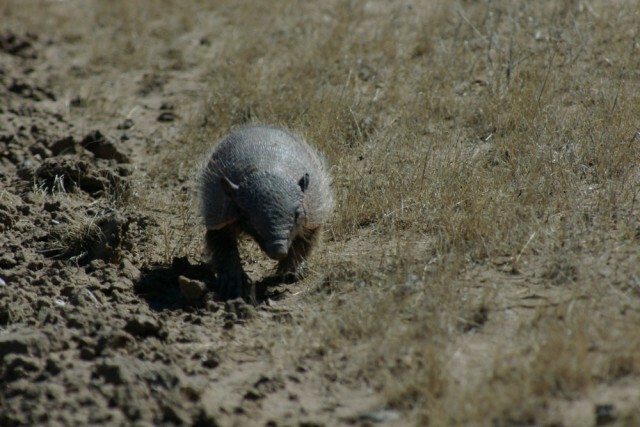 Another strange animal, a large rodent, the Mara looks like a huge guinea pig – strange – and a tiny rodent called a Cuis. Leaving Peninsula Valdez and back on Ruta 3, we stopped at various little villages en route, camped, savoured the local cuisine, and took in as much of the terrain our memories could store. Eventually we drove into the oil city of Comodoro Rivadavia – oil rigs everywhere. Apparently way back in 1907 locals were drilling for water in this arid part of the world, Patagonia, and stuck gold in the form of oil and the industry changed from sheep and wool to the major supplier of fuel for Argentina. What a boon. 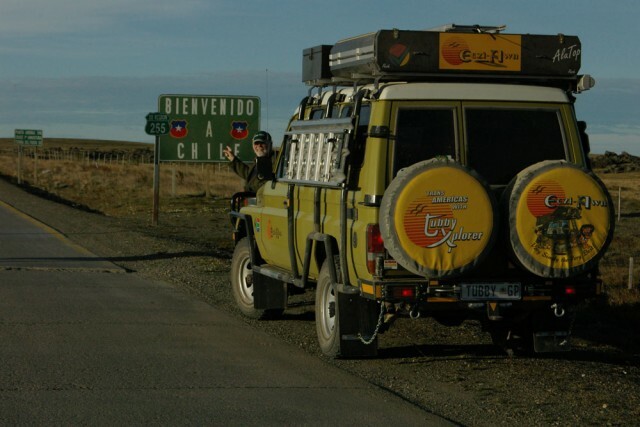 The last city en route south was Rio Gallegos before reaching the border with Chile. What stood out most was virtually all the towns and cities we passed through were named after heroes or explorers e.g Francisco de Viedma who in 1779 with his men dying of fever and lack of water at Peninsula Valdes put ashore to found the city that would later take his name. Another was a Welshman Love Parry, Baron of Madryn after whom the city of Puerto Madryn was named in 1806 then there was Sarmiento who’s name you find on every street plaque in all the villages and cities here in Argentina and it seems that St. Martin and 9 Julio virtually always the main streets close or near the central plaza around which these place evolve. It is very easy to locate places as the street signs give you block numbers, very similar to the ones I first saw in New York and almost all towns and cities have one way streets very clearly demarcated on the street signs and these one ways are almost guaranteed with alternate streets left to right and the traffic flow in the next street in the opposite direction. There are very few robots and all other intersections do not have any marking whatsoever e.g. stop or yield. You have to keep your wits sharp as hell because as mentioned before the Argentinians drive like maniacs – each one thinks he is a Grand Prix or Indy car driver in the making. 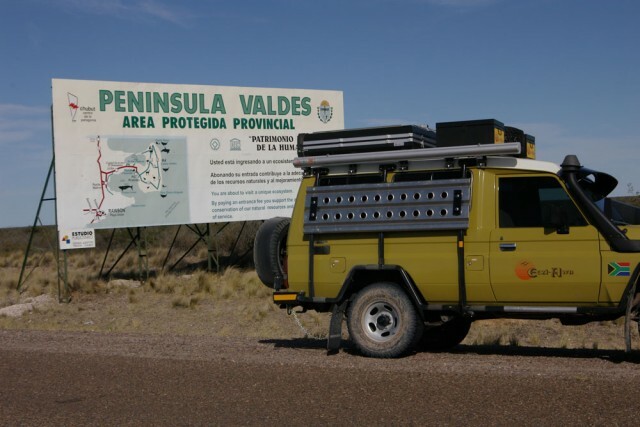 To date we have found the Argentinians very friendly and helpful folk, nothing is a problem, and at the border crossings most officials will chat away especially if they hear you have come from Africa the dark continent of the world. 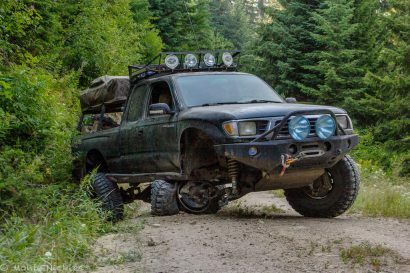 The vehicle attracts a lot of attention especially in the guise and livery and being a 4×4. 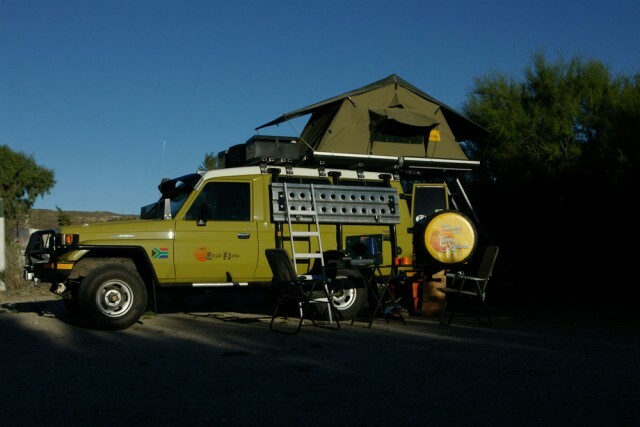 Exceptionally few Land Cruisers to be seen down this part of the world till now one Troopie and we could count the number of Toyota Land Cruisers on one hand – amazing when you come to think it is the most reliable 4×4 by far!!!! 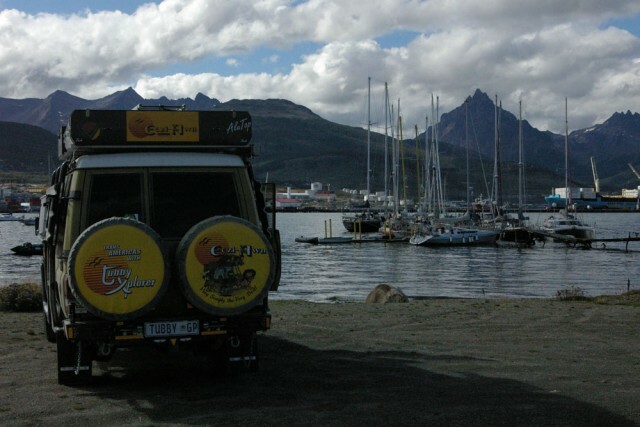 Driving into Chile it was not long before we reached Puerto Delgada just in time to drive straight onto the ferry and a short jaunt of 25 minutes across the Magellan Straits to the Island of Tierra Del Fuego. Ripio roads on this part of the island which belongs to Chile and another border crossing to the east side belonging to Argentina. We decided to stop over at an Estancia. 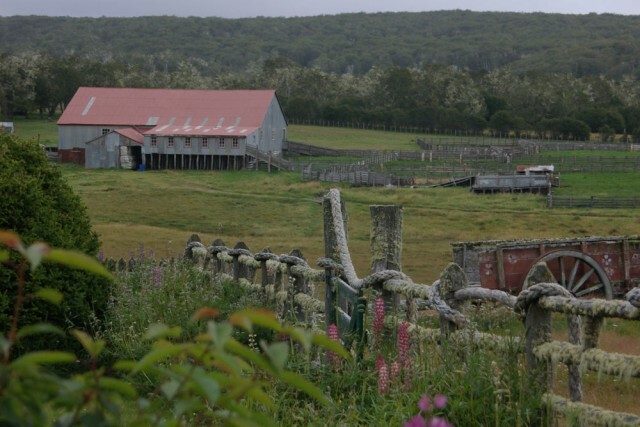 Estancia Rolito by Patagonian standards a small sheep farm but still in extent of 17,000 hectares. Most hospitable hosts – for lunch we were treated to an Asado, which is a lamb spread-eagled on a spit, well salted and grilled over an open fire. I have never eaten so much lamb in one sitting – delicious. Beavers brought into the area by the early settlers proved to be a disaster as uncontrolled they destroy huge tracts of indigenous Lenga forest. So it is outright war between farmer and foe. The farmer breaks the dams that they build and destroys the animals. We stayed for two days and eventually dragged ourselves away and drove south across a scenic pass to Ushuaia the most southern city in the world sandwiched between the Beagle Channel and jagged glacial peaks which rise from sea level to 1500 metres. Arriving late in the afternoon we drove directly to the National Park Tierra Del Fuego – lovely campsite at the end of Ruta 3 according to Argentinian road signage 3065 kms from Buenos Aires but by then we had in fact driven in excess of 4,000 kms. Further you cannot drive as the road finishes at the edge of Lago Lapataia. The next day I did some running repairs, tightened nuts and bolts etc. – ripio roads shake everything loose and must be seen to at regular intervals. 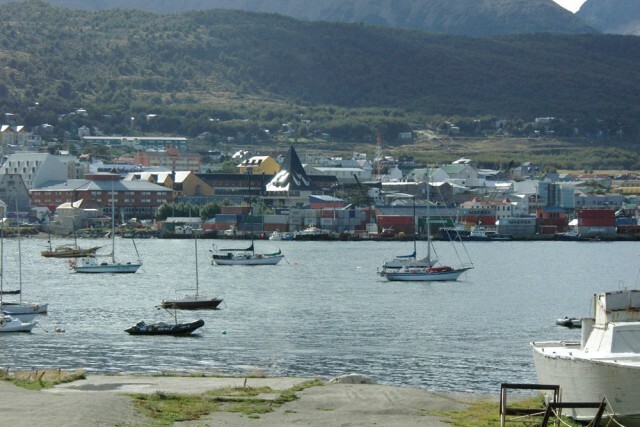 Then off to town – Ushuaia was a penal outpost for criminals and political resistors for many years. Thus to bring trade to the area it became a port for exporting sheep and a huge fish industry but of late all that has gone out of the window and the electronics industry together with tourism has become its main lifeline. Ushuaia is a gateway to the Antarctic, Falkland Islands, a base for sophisticated yachtsmen, lastly a coveted destination for adventurous travelers. 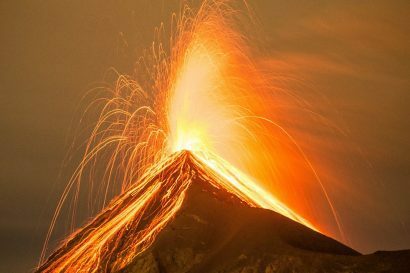 The city is a calamity of wooden houses – no planning or order whatsoever – one person could have a mansion and his neighbor could be living in a timber shack next door. However, this seems to be changing and it looks as if more affluent people are investing and settling into housing complexes. Newer and smarter housing built and I can only hope its not foreigners taking advantage of the Argentinean currency and buying up the Argentine countryside at bargain basement prices because eventually it filters through and the locals suffer as everything becomes expensive for them. Ushuaia being surrounded by mountains with touches of last years snow on the higher reaches and peaks. Many of the houses are painted in various bright colors so in spite of them being constructed of wood the overall view of the city, surrounding mountains and ocean is extremely picturesque. En route we decided that we would only call home once a week on a Sunday unless there is an emergency. The satellite phone, a Motorola 9505 that operates on the Iridium system, proved most valuable –worked well. We took photographs with a Pentax SLR camera that we stored via the laptop computer and then onto disc and the videos we kept until we got home to edit and store. One of the most amazing aspects of the Argentineans was that they love their dogs no matter what breed, the most prevalent seems to be mongrel mutts of every size and description, and believe me there are literally hundreds in Ushuaia and other towns and cities. I don’t believe there is a household without one or more. When one drove through town all you saw were dogs scampering in all directions and who annoyingly barked all night. At times I wished that I had a shotgun to hand!!!! Another factor we had to get used to were the shop hours. They opened at 0900 hrs, shut at 1200 hrs for siesta and re-opened at 1600 hrs and finally shut at 2100 hrs and the folk eat and entertain late into the nights and early hours of the following morning. We will keep word coming. Adios until then.